This program is an avocation course. The Phlebotomy course for professionals from the related field like Patient Care Technicians and Certified Nurse Aides, who want to get an in-depth knowledge about the field and use it to advance in the field. This program could be used towards professional development or continuing education. This program could be used towards professional development or continuing education. 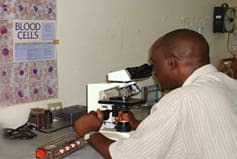 To enroll in the course, the students should have completed or should have been enrolled in the following areas/programs but not limited to: Certified Nurse Assistant (CNA) program or Nursing related field or Biomedical Science Program or currently working in medical field or has a medical background and is looking to enter into a research field. If you do not have the prerequisites to do the Phlebotomy program, look into the Patient Care Technician program. The student may be required to bring in their family and friends to volunteer for them in order to meet national exam requirements. For example: Phlebotomy students are required to get their own volunteers to complete 40 blood draws. The student is also expected to volunteer for the other fellow students in the lab. Majority of the draws and lab practice is done with the students that are in class, however it is the students responsibility to stay on track with completing the 40 blood draws within the time-frame of the program. Phlebotomy students must have their instructor sign off on each successful blood draw on their log sheet in order for the student to be eligible to take the National Certification Exam to become certified.